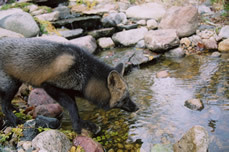 Fox species in North America include the red fox, gray fox, arctic fox, kit fox, and the swift fox. The red fox is by far the most common species. It is extremely adaptable and able to adjust to many different habitats. Foxes are members of the dog family, Canidae, although their behaviors sometimes remind us more of felines. Their general appearance is similar to dogs, wolves and coyotes. However, foxes are much smaller than coyotes or wolves. They measure (on average) 22-32 inches (56-82 cm) in length for the head and body. The tail adds about 14-16 inches (35-43 cm) to this. An adult fox weighs from 6-15 pounds (2.7-6.8 kg) which is about the same as a house cat. So, while there are many stories about foxes predating domestic cats, this is not common unless the animal is extremely hungry. “Red” foxes actually come in several different color phases. The typical red fox has a reddish coat, white-tipped tail, and black “stockings”. The white tail tip distinguishes this fox from other species, no matter what the color phase. Several color phases can occur in one litter. 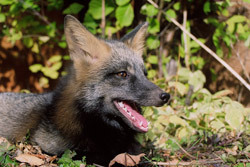 The phases are described by the coat color; black, silver, and cross foxes. The silver phase is similar to the black color, but it has silver-tipped guard hairs that give it its name. The cross phase has a dark (black/brown) “cross” over the shoulders and down the back. The dark phases are more common in the north, but are still unusual. 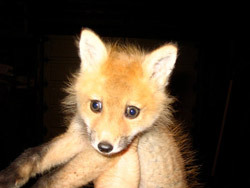 Red Foxes breed during February and March. They use a den which is about 15-20 feet long, often on the side of a knoll. 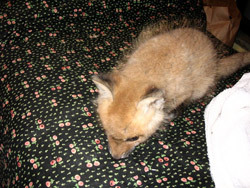 Sometimes foxes will dig their own dens, but more often, they use “pre-made” dens which were once the homes of small mammals (such as a badger) or a larger animal, such as an old coyote den. They expand or fill in the den as needed to make it their home. Foxes will return to the same den if it was successful the previous year. Within the den, the “kits” (baby foxes) are born into a grass-lined nest after a gestation period of 53 days. These kits are born blind but well-furred. 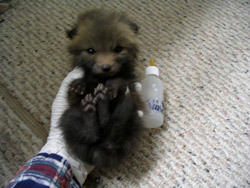 Most foxes have from 3-6 kits in a litter, but some foxes have been know to have up to 10 or 12. Generally only one litter is born each year. 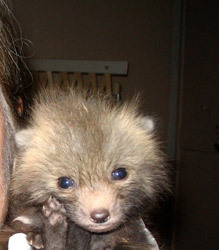 Their eyes open at 8-10 days of age and they venture outside of the den at about 5-6 weeks of age. Both parents raise the young, so if one is injured, the other can continue to raise the kits. The kits are weaned gradually and learning to hunt by 3 months old. They usually leave their parents in the fall and seek out their own territory. Foxes are omnivores. They are able to eat almost anything. Their favourite foods are small mammals (voles, squirrels, muskrats, hares, birds, and carrion) but they also enjoy eggs, insects, and vegetation. It is this very adaptability that allows them to vary their diet to what is available. Foxes hunt alone, rather than in packs like wolves or dogs. Many city-raised foxes have learned to scavenge in garbage cans or find pet food that has been left outside. In times of plenty, foxes will cache food and hide it for use later. 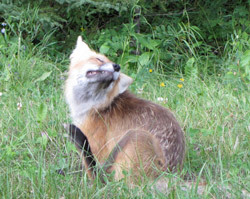 Foxes are capable of adapting to a wide range of habitats and can thrive close to humans, but they prefer wild settings. They require only a source of food and cover. Foxes are quite vocal, having a large repertoire of howls, barks, and whines. The red fox has several natural enemies: man (principally as trappers), wolves, coyotes, lynx, wolverines, and perhaps bears. Eagles can be a major predator of young foxes in some areas. They are wild animals, but if humans do not disturb them, they are quite compatible with urban, suburban and rural settings. They have lived in harmony with people in the National Parks without incident since the parks were formed. 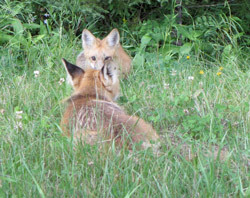 Many farm families enjoy watching the antics of the young at the den each spring. 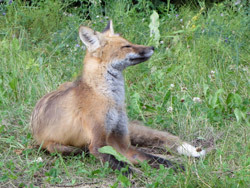 If humans are respectful and maintain their distance, foxes are not aggressive animals and do not go out of their way to attack or otherwise antagonize people. Any wild animal, if habituated to expect food from humans will become problematic.